Junior has thrown for 922 yards and 12 touchdowns in his last two games alone. 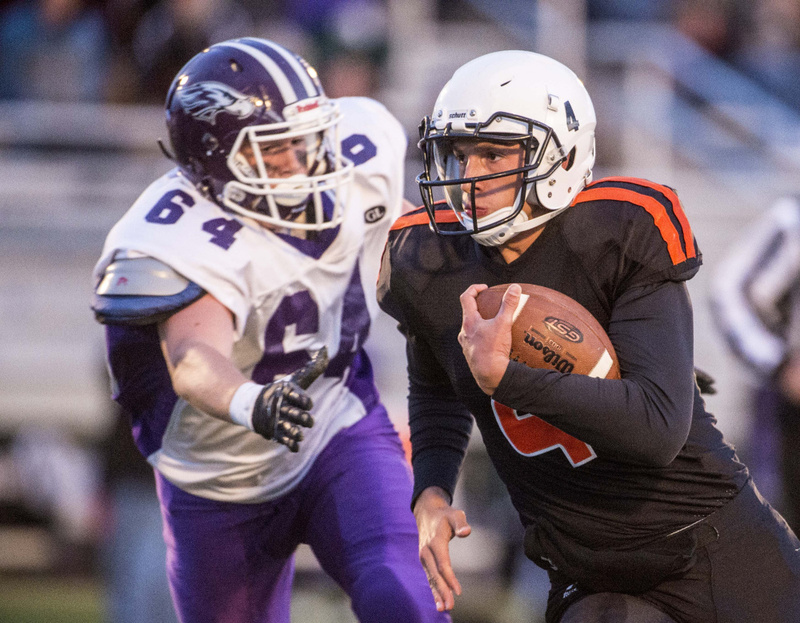 Skowhegan quarterback Marcus Christopher put up video game-like stats over the last two games, with 922 yards passing and 12 touchdown passes. That’s a very good season for many high school quarterbacks. Skowhegan coach Ryan Libby thinks his junior is just getting warmed up. Christopher threw for 472 yards and seven touchdowns in a 48-29 victory at Brunswick last Friday. That came off a 450-yard, five-touchdown effort in a 57-42 loss at Messalonskee. Skowhegan (2-2) allowed more than 50 points in each of its losses, but Libby said the Indians made strides defensively against Brunswick. “We definitely took a step in the right direction against Brunswick. We still had some lapses stopping the run, but when we line up right, we do our job, we’re starting to see we can actually do it. It’s just a matter of doing it consistently at this point,” Libby said. Skowhegan hosts Hampden (0-4) on Friday, before ending the regular season against three teams that, like itself, are fighting for a playoff spot: Class B South member Biddeford (2-2) along with Pine Tree Conference rivals Lawrence (2-2) and Mt. Blue (2-2). For the second week in a row, Messalonskee’s offense came close to scoring at will. A week after putting up 57 points in a win over Skowhegan, the Eagles scored 51 of their 65 points at Hampden in the first 12 1/2 minutes of the game. Messalonskee scored on its first six drives. None of those drives was more than two plays. The Eagles ran 10 offensive plays in the first 12 1/2 minutes and scored six touchdowns. Five of the touchdowns came on plays of 33 yards or more. The Eagles also added a safety and defensive touchdown to lead 51-0 with 11:35 left in the second quarter. Things get tougher for Messalonskee (3-1) this week, when they play at Class B South frontrunner Falmouth (3-1). A potentially big win for Cony came with two potentially bigger losses. Linebacker Mike Wozniak and defensive lineman Jake Mills left the Rams’ 32-8 win over Mt. Blue within minutes of each other at the end of the second quarter, with each suffering season-ending ACL tears while defending a Cony fumble and interception, respectively. The two were starters, and worse, two of the team’s key players. Mills led the team in sacks, while Wozniak entered the game as the team’s leader in tackles. The timing of the injuries meant Cony got a head start on making up for the players’ absence. Mills was a two-way starter on the defensive and offensive lines, and defensive tackle Devon Thomas took his place at center while Allyx Chabot filled in at defensive end. Jakob Arbour, who wasn’t starting on either side of the ball before taking over at right tackle two weeks ago, will start both ways now after sliding over to Wozniak’s spot at linebacker on defense. Lippert was happy with how all three looked, but said the team could shift players around to find the best mix. Around the state: The big game in the state this weekend is 4-0 Bonny Eagle at 4-0 Thornton Academy. The winner takes first place in Class A South. Kickoff is 1:30 Saturday afternoon. The two are amongst the remaining eight undefeated teams. The others are Edward Little, Kennebunk, Marshwood, Leavitt, Wells and Lisbon… At 4-0, Edward Little is off to its best start in a decade. In 2008, the Red Eddies went 3-1 in the first four games and went on to the Pine Tree Conference Class A championship game, which they lost to Skowhegan.